I theorize that the size of a lunch table can affect the efficiency of your company. Below are the assumptions this theory is based on. 1. The flow of communication and knowledge is important in an organization. When workers know the company’s strategy and what the other sections of the company are working on, synergies can be created. 2. Companies that are organized functionally can, more easily, have problems with this flow of communication and knowledge because there nature doesn't tend to promote communication (functionally organized companies will be what the bulk of this essay is targeted towards). 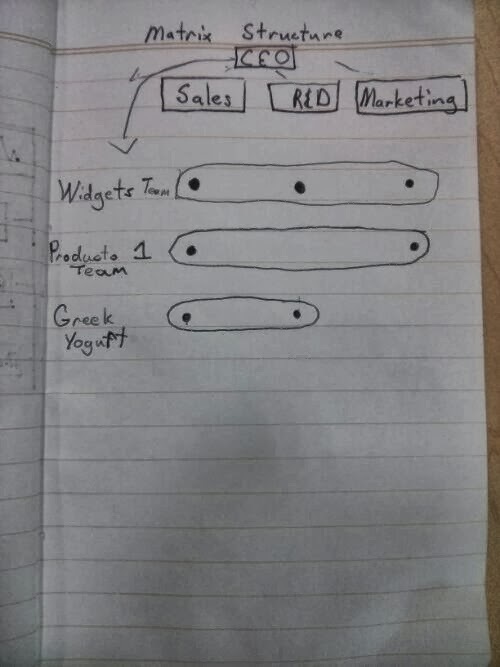 (A functionally based company is one that (like above) has different business segments, and in each of those segments, a separate departments to support it Marketing in Widgets is a completely different segment than Marketing in Greek Yogurt, they work separately and have different goals than the other). 3. This flow of communication and knowledge is facilitated by the forming of social groups. A social group is a group of people who exchange information with each other (business or personal) due to some bond or trust. The bigger and more diverse the group the better because facilitates the flow of knowledge in the company. It is best if some members have access to multiple social groups and exchange information from one to another (IE two people from Marketing, one from Finance, two from Accounting, and all from different segments of the company). I believe that the average number of people in a social group (N) in a functional organized company can be approximated by the average number of chairs that can comfortably fit around one of its lunch tables. B) They feel obliged to sit with their colleagues, boss, and others who work in their section of the company because it was tradition before they came to the company. Besides, eating and talking with your boss may gain you favor later on. So where do lunch tables come in? Let’s think about your sales team. You have a sales team for the North, South, East, and West of your country. You cheaped out on the lunch tables and you can only sit one of these teams at one table. So you have the North sales team members sitting with the North sales team, the South sales team members sitting with the South sales team, etc. Here communication only happens inside this small group. All of them use cold calling and think it’s the best way to sell widgets. But then there’s a sale on tables and you install a table big enough for East and South to sit at. Of course they will sit together, they feel obligated to because they are part of the same team. East mentions they think meeting people at trade conventions is a better method of selling, and as they talk, South realizes that they could earn a lot more if they used this technique too. Two sizes bigger and now you have the entire sales team talking, trading tips, and forming better bonds. This is good, but it could be better. The very next week your production team has had difficulties making widgets, and while they sent an email to the sales team, it was overlooked. Maybe sales thought it was an exaggeration, or saw that it was from someone they weren’t fond of, regardless your sales team is now selling widgets that you don’t have, and won’t be able to make; and when your customer find out they aren’t going to get their orders, they won’t be happy. You could have prevented this situation by improving interdepartmental communication, and one method of achieving this is again through lunch tables. If the tables in your dining hall are large enough for the entirety of one business section to sit at, then there is the chance that another department might sit next to it, one thing leads to another and they’re both updated on each others' affairs. Unfortunately this strategy can’t work forever. You only have so much space for tables and even if you do get different departments to sit next to each other it doesn’t guarantee communication flow. Now lunch tables become less important; there are two other ways to use lunch to increase communication. You can always push your company to adopt a matrix structure. 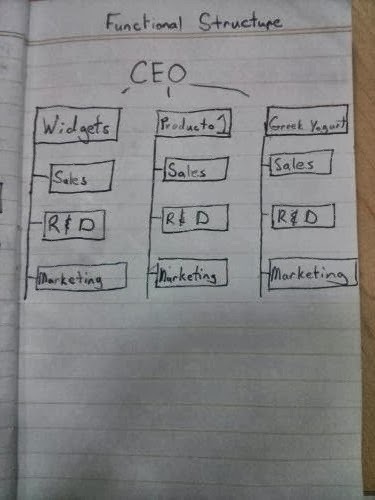 In this structure workers have multiple bosses and groups they report to (one person can reports to bosses in both the Sales segment and the Widgets Product Group). If you have someone working for two departments, cross departmental communication is almost guaranteed, especially in the lunchroom. Because someone has two work groups, it would be more widely accepted to eat with a different group at lunch (people know you have a responsibility to be with both groups). Larger dining tables work wonders here, lunch groups will already be filled with a wide variety of people, and the size of the table allow for the social group to be much larger. If you can move to a matrix structure, go for it. But changing from a functionally organized business to a matrix organized business is easier said than done. An alternate method is to provide incentives for eating together. People love free lunches, offer a free lunch to people who sign up and choose who they will eat it with. Instant connections. Plus those involved may feel the obligation to eat with the person again or invite them to the table to eat (it would be awkward if you saw him every day in the lunch room and only waved). This would make eating away from your group, and bringing in others to eat with your group more acceptable. Of course this isn’t the only solution to communication problems, but it is something to keep in mind!